Many SEO professionals have mentioned that you no longer need to worry about keyword density. While this is partially true, it has created some confusion about how to plan and optimize content to rank for multiple terms. Keyword selection and keyword density are both just as important today as they were 10 years ago, the methods of implementing them have changed, however. Historically, you would check the keyword density of the top 5 or 10 sites, determine the average density for one term, and use that for your own content. It was standard practice to place the exact same keyword in the URL, page title, Meta description and at least the H1 heading. Most of you wouldn’t even consider doing this today for fear of overoptimizing your page. Below we are going to look at how to find and implement keywords using competitor rankings to drive your strategy. 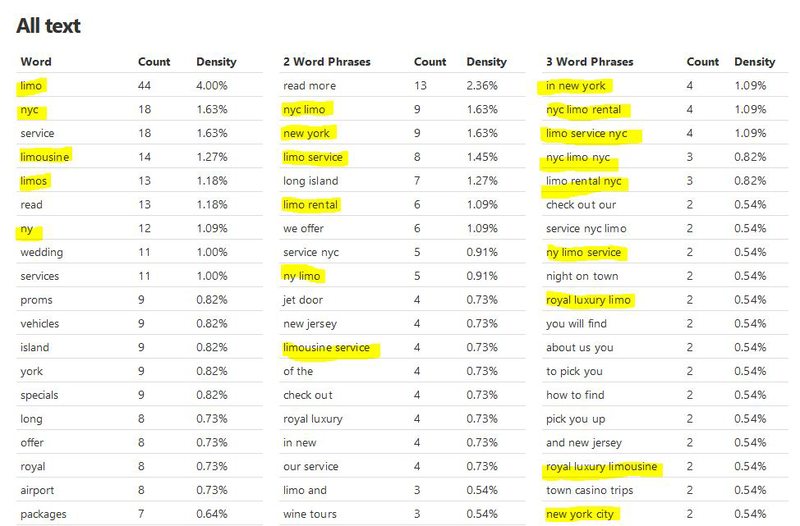 Above is a snapshot of a company (http://www.royaluxury.com/) ranking for “limo service nyc”. As you can see above, the terms limousine and New York appear in their content several ways. While most of the highlighted terms cover the location or service, you can see several ways in which they have done so. In the past, you would have been more likely to see the term “limo service nyc” appear repeatedly and the numerous variations would not have been intentionally included. Since this page does include so many variations, it can rank for those as well. For example, if you search “limo rental nyc” this site also ranks. If you were to create a spreadsheet for this site and the others top 10 ranking sites, you would end up with a long list of terms used on your competitor’s websites and the average density of those terms. The next thing to determine is which variations appear in key areas of your competitors’ website. One of the easiest ways to do this is with SEOquake, a free browser extension. Install the extension, visit your competitor website, then click on the “density” tab and you will be handed all the information you need to formulate your plan. As you can see above, the “found in” column tells you which elements each keyword appears in. This includes tile, Meta description and H1 tags. Where this becomes most useful is when you have a primary keyword target in mind. If you don’t have a primary keyword selected, viewing your competitors top keywords is a quick and simple way to find some good keywords. There are several tools that allow you to spy on your competitors, SEMrush is one such tool. 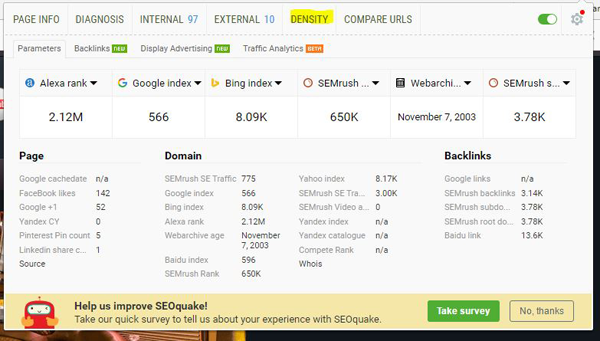 The screenshot above is taken from SEMrush and as you can see, it allows us to find keywords a competitor site is ranking for, the estimate search volume and what percentage of that sites traffic comes for each keyword. You can gather this information from the top ranking 5 or 10 sites and compile the information into a spreadsheet. At that point, you will have a list of the terms with the highest search volume and those that send the most visitors to a competitor site. If you have been following along so far, you should have a list of keywords you want to target, a list of your top 10 competitors for those keywords, and a spreadsheet outlining the average density and location of your target keywords on your competitors’ sites. Once you have this information, you should create a simple outline of your page content. Following the keyword implementation used for top ranking sites should help you create pages more quickly since you have a clear plan. When developing your landing pages, start by outlining the heading tags. Remember, heading tags are used to develop a hierarchy on your page. The data uncovered in your competitive research will give you the keywords needed in each heading, but more importantly, they provide you with clear ideas of what to cover on your landing page. If 10 of 10 competitors are addressing a specific pain point, chances are it is a valid one. Next week we will go into detail on how to build content based on SERPs but for now, let’s keep it simple. Visit the ranking page for the top 10 sites for your keywords and find out how long the average content is for your terms. This can also be done quickly using SEOquake. Just like before, find the average content length and shoot for your content to be near that average length or longer. Many of you may think this is simple stuff and if so, you are right. Unfortunately, there are a ton of business owners, in house marketers, and even SEO service providers that still don’t get this right.